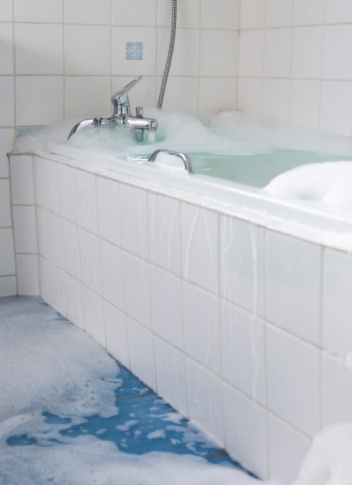 How Many Gallons of Water Does the Average House Bathtub Contain? Bathtub shapes and sizes vary the world over, but in North America, the prevailing preference is for long tubs that allow you to stretch out your legs. While tubs of this type come in various sizes, the standard length is 5 feet, and the standard width is either 30 or 32 inches. The capacity of the tub also depends on its depth and the placement of the overflow drain; the capacity of a 30-inch tub with a depth of 14 inches -- which is in the midrange of standard depths -- is about 110 gallons. The tub won't hold that much, though, because the overflow drain is typically placed 4 inches or more below the top of the tub. With a 4-inch placement, the capacity of the tub is 78 gallons. If the overflow hole is 6 inches below the top of the tub, the capacity becomes 62 gallons. While elongated tubs are the norm in North America, they are by no means the only type available. Corner bathtubs are usually considered space-saving fixtures, and they hold less water. The average corner tub is 54 by 54 inches, with a diagonal of 72 inches, and if that tub has a depth of 14 inches, its capacity is 88 gallons. With an overflow drain placement 6 inches below the top of the tub, the capacity is a mere 50 gallons. Freestanding tubs come in many designs to fit a variety of spaces, and they tend to be smaller and deeper than inset tubs, but they hold more water. They range in length from 4 feet to 6 feet and in width from 24 to 32 inches. Depth can range from 14 to 24 inches. The deepest 4-foot freestanding tub with a width of 30 inches and overflow hole placed 6 inches from the top holds 112 gallons. The same tub, with a depth of 18 inches and the same placement of the overflow hole, holds 74 gallons. How Much Weight Can an Acrylic Bathtub Afford? What Size Is a Standard Clawfoot Tub?